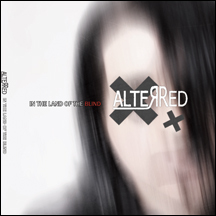 After months in the studio, MikEy AlterRed and Vix Vain have once again emerged with a new masterpiece in the form of the album, "In the Land of the Blind..." Always striving to explore and expand their sound, AlterRed has stepped away from the familiar electro-cabaret sounds and focused on their more rock-industrial and electro-rock influences. MikEy's powerful vocals and dark lyrics tell the tales of love, lust, lunacy and loss, while acting as the string that ties the whole release together. Bigger, harder, faster and darker.